It’s not easy to write a white paper. And reading them can also be quite a challenge. Unfortunately, many white papers are difficult to digest and come across as though slightly ‘nerdy-types’, locked in research labs, prepared them with very little consideration for their readers. Like other types of publications, such as a case study, the white paper has an accepted format that is recognized by its readers. Try to stick to this approach as readers are familiar with this style. Only more experienced writers should try more adventurous formats. Individuals with little writing experience are often delegated to write the white paper. In the IT industry, there is an assumption that the developer is best suited to write about the solution. Let’s be honest: writers write and programmers program. There are some individuals who have both skills, but these are hard to find. In general, developers are not ideal for writing white papers; and neither is the Sales Manager. Developers will focus on the technical innards, while sales types will gust about its ‘unique’ qualities. In doing so, both miss the mark. You can save yourself a lot of stress by hiring an experienced writer who can look at your product or service – and present it in an easy-to-understand manner. These writers know how to ‘sell’ a concept to both a technical and business audience—not everyone has this skill. Attractive graphics reinforce your message. Use diagrams and charts to stop ‘glazed eyes syndrome’ setting in. Text-heavy documents drain the reader very quickly! By combining charts, diagrams and tables you weave together the main selling points and sustain the reader’s interest. Geekspeak and Three Letter Acronyms—e.g. B2B, B2G—are endemic in the IT industry. Experienced writers avoid TLAs as they know that readers won’t understand the terminology, become frustrated and move on. If you have to use these terms, put a reference section at the start. No-one likes to be patronized. Technical terms without a clear definition will lose the reader’s confidence in both you and your products. They will stop reading and go somewhere else. Why not? After all, your beloved White Paper is not the only show in town! Before you get to the heart of the paper, outline the relevant background materials, such as industry research figures, that support your arguments. In the opening section, highlight why your solution exists; in other words, what specific problem does it solve? Don’t meander from topic to topic or you will lose the reader. Each paragraph should only discuss one idea. Don’t mix ideas in the same sentence or paragraph. For example, before you begin, assume that the reader is completely new to the subject matter. Then outline the most significant issues and progressively walk through the solution; begin with the larger issues first and sequentially move though the other points. Many white papers discuss the theoretical application on the solution, e.g. Product X will do Y in situation Z. That’s fine up to a point as it helps paint a picture for the reader. However, you need to underline your ‘theory’ with real world examples. Case studies and customers quotes are a very effective way of demonstrating how your solution performs in a working environment. Case studies reinforce the theoretical concepts. They help the reader see how the solution could work for them. If the reader can’t relate to your solution in a practical sense, they will search elsewhere for another product. Oddly enough, many of us read the summary first. Because of this, it should capture the essence of the white paper and identify the most interesting points. If this section lacks interest, you may lose the reader — before they’ve even read the first page! Make your points. Make them clear. Make them stick. 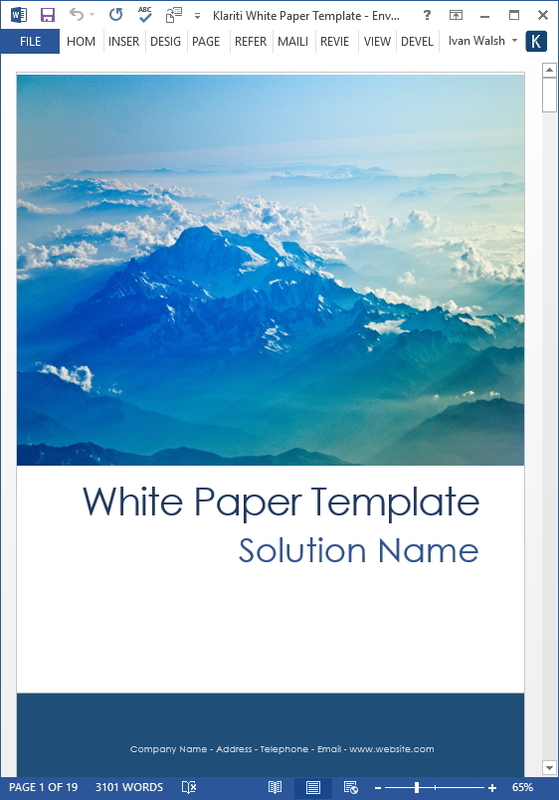 White Papers are a low-cost way to promote your products and potentially gain an advantage over your competitors. They also have a long shelf-life. They live on the web, intranets, and hard-drives long after your product has been rebranded, you’ve changed business strategy, or moved onto the golf course. For this reason, ensure that your publication reflects positively on your company’s high standards. Poor quality material will have the opposite effect of what you intended. Persistence is the key. Once you get it right, a well-written white paper pays for itself many times over in the long-term.